Why now? Well, creating a successful Kickstarter is a monumental task. We researched and hustled furiously to put together the best damn campaign we could muster. And while we thought we were onto a winner, it seems things haven’t quite taken off like we’d hoped. This tells us something is missing, especially when we consider all the wonderful feedback we’ve received from you, our current backers, and every one we’ve demoed to at GDC. 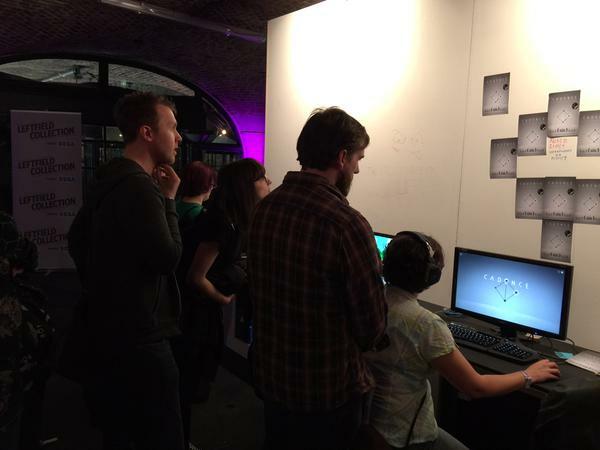 And we hear that at day one of Rezzed yesterday people were lining up to play our silly little sound game. The truth is that Cadence is quite unprecedented in terms of games, and it seems it’s quite hard to explain it unless people get to see it in action. So here we are. We’re taking on feedback and adjusting course, because we certainly don’t know everything and we’re learning as we go. So besides playing Cadence and seeing what it’s really about, we’d like to ask you a favour. With this demo, we’re hoping to kick off the momentum we need to get over the finish line. All of you who have backed us so far are wonderful people for understanding what we’re trying to achieve with Cadence, but the goal is still a long way away. We’d like to request a few seconds of your time to help amplify the news that anyone can now try Cadence for themselves. News aggregators are a great way to make strangers aware of the game that have never heard of it before. But the way these services work means that unless we get an initial boost of votes we’ll fall off the radar before anyone gets to see it. So if you hang out in any of these places please throw us a vote. Featuring 20 levels of the game to give you a taste of what Cadence is about. Please note that this is what we consider alpha level, which means several things might change by the time we reach final release, and you may well encounter bugs and some rough edges.